COPYRIGHT: Unless otherwise noted, all of the material on this web site is Copyright © 2011-2013. All rights reserved. No part of this web site may be reproduced, published, distributed, displayed, performed, copied or stored for public or private use in any information retrieval system, or transmitted in any form by any mechanical, photographic or electronic process, including electronically or digitally on the Internet or World Wide Web, or over any network, or local area network, without written permission of the author. No part of this web site may be modified or changed or exploited in any way used for derivative works, or offered for sale, or used to construct any kind of database or mirrored at any other location without the express written permission of the author. Permission is granted to download and print the materials on this web site for personal, non-commercial use only, and to display it on your personal computer provided you do not modify the materials and that you retain all copyright notices contained in the materials. You may use one image from these pages as desktop wallpaper on your personal computer if you would like, but you may not use these images or text on your world wide web home page, nor may you post them to a WWW, FTP or BBS site. You may not, without the author’s express written permission, “mirror” any material contained on this web site on any other server. Any unauthorized use of any material contained on this web site may violate copyright laws and subject to violator to legal judgment and penalties. TRADEMARKS: All other products or name brands are trademarks or service marks of their respective rights holders. On these web site trade names, trademarks, and service marks of companies may have been used, but no such uses are intended to convey endorsement of, or any affiliations with, this web site by those companies. All terms mentioned on this web site that are known to be trademarks or service marks have been appropriately marked. However, the author cannot attest to the accuracy of this information. NO WARRANTIES: ANY MATERIAL, INFORMATION, TEXT, GRAPHICS, ILLUSTRATIONS AND PHOTOS ON THIS WEB SITE MAY CONTAIN TECHNICAL INACCURACIES, MISTAKES, ERRORS, OMISSIONS AND TYPOGRAPHICAL ERRORS, BOTH IN CONTENT AND PRESENTATION. THE INFORMATION PROVIDED ON THIS SITE IS PROVIDED ON AN “AS IS” BASIS WITHOUT WARRANTIES OF ANY KIND, EITHER EXPRESS OR IMPLIED, INCLUDING, BUT NOT LIMITED TO, WARRANTIES OF TITLE, NON INFRINGEMENT OR IMPLIED WARRANTIES OF MERCHANTABILITY OR FITNESS FOR A PARTICULAR PURPOSE. NO ADVICE OR INFORMATION GIVEN BY A GIRL AND A GUN WOMEN’S SHOOTING LEAGUE, LLC OR THE AUTHOR SHALL CREATE ANY WARRANTY. THERE SHALL BE NO LIABILITY ON THE PART OF A GIRL AND A GUN WOMEN’S SHOOTING LEAGUE, LLC OR ITS AUTHOR FOR ANY LOSS OR DAMAGE, DIRECT OR CONSEQUENTIAL ARISING OUT THE USE OF, OR INABILITY TO USE THIS INFORMATION. ANY MATERIAL DOWNLOADED OR OTHERWISE OBTAINED THROUGH THE SITE IS DONE AT YOUR OWN DISCRETION AND RISK, AND YOU ARE SOLELY RESPONSIBLE FOR ANY DAMAGE TO YOUR COMPUTER SYSTEM OR LOSS OF DATA THAT RESULTS FROM THE DOWNLOAD OF ANY SUCH MATERIAL. REFERENCES TO CORPORATIONS, BUSINESSES, OR INDIVIDUALS, THEIR SERVICES AND PRODUCTS, ARE PROVIDED “AS IS” WITHOUT ANY WARRANTY. A GIRL AND A GUN WOMEN’S SHOOTING LEAGUE, LLC AND ITS AUTHOR DISCLAIM RESPONSIBILITY OR LIABILITY FOR ANY SPECIAL, INCIDENTAL, INDIRECT OR CONSEQUENTIAL DAMAGES OF ANY KIND, OR ANY DAMAGES WHATSOEVER, INCLUDING, WITHOUT LIMITATION, THOSE RESULTING FROM LOSS OF USE, DATA, OR PROFITS, WHETHER OR NOT ADVISED OF THE POSSIBILITY OF DAMAGE, WHETHER IN AN ACTION OF CONTRACT, NEGLIGENCE OR OTHER TORTIOUS ACTION, AND ON ANY THEORY OF LIABILITY, ARISING OUT OF OR IN CONNECTIONS WITH THE USE OF PERFORMANCE OF THIS INFORMATION. NO REPRESENTATION OR WARRANTY IS MADE THAT THE CONTENTS OF THIS WEB SITE, TEXT OR GRAPHICS ARE FREE FROM ERROR OR SUITABLE FOR ANY PURPOSE; NOR THAT IMPLEMENTATION OF SUCH CONTENTS WILL NOT INFRINGE ANY THIRD PARTY PATENTS, COPYRIGHTS, TRADEMARKS OR OTHER RIGHTS. Please note that some jurisdictions may not allow the exclusion of implied warranties, so some of the above exclusions may not apply to you. DISCLAIMER OF LIABILITY: VISITORS TO THIS WEB SITE ASSUME ALL RESPONSIBILITY AND RISK FOR THE USE OF THIS SITE, LINKS TO OTHER WEB SITES ON THE INTERNET, AND THE INTERNET GENERALLY. A GIRL AND A GUN WOMEN’S SHOOTING LEAGUE, LLC AND THE AUTHOR OF THIS SITE DISCLAIM ALL WARRANTIES, REPRESENTATIONS, PROMISES OR ENDORSEMENTS, EXPRESS OR IMPLIED, INCLUDING, BUT NOT LIMITED TO, WITH REGARD TO THE INFORMATION ACCESSED FROM, OR VIA, THIS SITE OR THE INTERNET, INCLUDING, BUT NOT LIMITED TO, ALL IMPLIED WARRANTIES OF MERCHANTABILITY, FITNESS FOR A PARTICULAR PURPOSE, OR NON INFRINGEMENT. A GIRL AND A GUN WOMEN’S SHOOTING LEAGUE, LLC AND THE AUTHOR DO NOT ASSUME ANY LEGAL LIABILITY FOR ERRORS OR OMISSIONS IN THIS WEB SITE OR OTHER DOCUMENTS WHICH ARE REFERENCED BY OR LINKED TO THIS WEB SITE, OR RESPONSIBILITY FOR THE ACCURACY, COMPLETENESS, OR USEFULNESS OF ANY INFORMATION, APPARATUS, PRODUCT, PROCESS, METHOD, OR THEORY DISCUSSED ON THE SITE. IN NO EVENT, AND UNDER NO CIRCUMSTANCES, SHALL THE AUTHOR OR CONTRIBUTORS BE LIABLE FOR ANY DIRECT, INDIRECT, INCIDENTAL, SPECIAL, INCIDENTAL, EXEMPLARY, OR CONSEQUENTIAL DAMAGES, INCLUDING, BUT NOT LIMITED TO, PROCUREMENT OF SUBSTITUTE GOODS OR SERVICES; LOSS OF USE, DATA, OR PROFITS; OR BUSINESS INTERRUPTION; OR LOSS OF PROGRAMS OR OTHER DATA ON YOUR INFORMATION HANDLING SYSTEM OR OTHERWISE, HOWEVER CAUSED AND ON ANY THEORY OF LIABILITY, WHETHER IN CONTRACT, STRICT LIABILITY, OR TORT (INCLUDING NEGLIGENCE OR OTHERWISE) ARISING IN ANY WAY OUT OF THE USE OF THIS WEB SITE OR INFORMATION CONTAINED HEREIN, EVEN IF ADVISED OF THE POSSIBILITY OF SUCH DAMAGE. IF YOUR USE OF MATERIALS FROM THIS WEB SITE RESULTS IN THE NEED FOR SERVICING, REPAIR OR CORRECTION OF EQUIPMENT OR DATA, YOU ASSUME ANY COSTS THEREOF. A GIRL AND A GUN WOMEN’S SHOOTING LEAGUE, LLC AND THE AUTHOR OF THE INFORMATION CONTAINED ON THIS SITE DO NOT ASSUME AND HEREBY DISCLAIM ANY LIABILITY TO ANY PARTY FOR LOSS OR DAMAGE CAUSED BY ERRORS OR OMISSIONS IN THE INFORMATION. DISCLAIMER OF ENDORSEMENT: REFERENCE HEREIN TO ANY INDIVIDUALS, COMPANIES, WEB SITES, PRODUCTS, SERVICES, INFORMATION, HYPERTEXT LINKS FROM THIRD PARTIES OR ANY OTHER INFORMATION BY TRADE NAME, TRADEMARK, MANUFACTURER, SUPPLIER, VENDOR, OR OTHERWISE DOES NOT CONSTITUTE OR IMPLY ENDORSEMENT, SPONSORSHIP, OR RECOMMENDATION OF THIS WEB SITE OR THE MATERIAL CONTAINED HEREIN BY SUCH PARTIES. REFERENCE HEREIN TO ANY PRODUCTS, SERVICES, PROCESSES, INFORMATION, HYPERTEXT LINKS TO THIRD PARTIES OR OTHER INFORMATION BY TRADE NAME, TRADEMARK, MANUFACTURER, SUPPLIER, VENDOR, OR OTHERWISE DOES NOT CONSTITUTE OR IMPLY ITS ENDORSEMENT, SPONSORSHIP, OR RECOMMENDATION BY A GIRL AND A GUN WOMEN’S SHOOTING LEAGUE, LLC OR THE AUTHOR OF THIS WEB SITE. LINKS TO OTHER SITES FROM THIS WEB SITE: A Girl and A Gun Women’s Shooting League, LLC and the author has not reviewed any or all of the web sites linked to this web site and is not responsible for the content of any other pages or web sites linked to this site. Web sites other than those under the domain A Girl and A Gun Women’s Shooting League, LLC are independent entities and a link from A Girl and A Gun Women’s Shooting League, LLC does not mean that A Girl and A Gun Women’s Shooting League, LLC endorses or accepts any responsibility for the content, or the use, of such a site. It is the user’s responsibility to verify the accuracy of information contained on other web sites, and to take precautions to ensure that web sites visited are free of such items as viruses, worms, Trojan horses and other items of a destructive nature. PRIVACY PERSONAL INFORMATION: In general, you can visit A Girl and A Gun Women’s Shooting League, LLC without telling us who you are and without giving any personal information about yourself. There are times, however, when A Girl and A Gun Women’s Shooting League, LLC may need information from you. 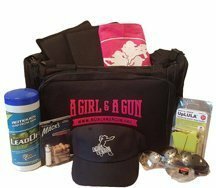 You may choose to give A Girl and A Gun Women’s Shooting League, LLC personal information in a variety of situations. For example, you may want to give A Girl and A Gun Women’s Shooting League, LLC information, such as your name and address or e-mail id, to correspond with you. 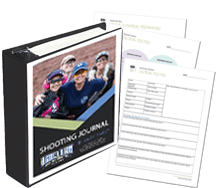 If you give A Girl and A Gun Women’s Shooting League, LLC personal information about somebody else, such as a spouse or colleague, A Girl and A Gun Women’s Shooting League, LLC will assume that you have their permission to do so. DISCLOSURE: A Girl and A Gun Women’s Shooting League, LLC will not sell, trade, or disclose to third parties any user identifiable information derived from the registration — including user names and addresses — without the consent of the user (except as required by subpoena, search warrant, or other legal process or in the case of imminent physical harm to the users or others). SECURITY POLICY: This website is hosted on a secure server to protect the information you provide during checkout. When you make your purchase, you will notice the URL change to HTTPS, which is encrypted through secure socket layer (SSL) technology. For our transactions, we have partnered with Authorize.net and PayPal, the industry leaders for processing secure credit card transactions. Your sensitive financial information is stored securely on their servers and we receive payment at our offices from the processor without ever seeing your financial information. For your safety and security, our processors use a high level of data encryption. Furthermore, to help safeguard you against identity theft, every payment is followed by an e-mail confirming your transaction. For your safety always look for the “Locked Padlock” at the bottom of your Internet browser to feel safe.